George Condos met his future wife at a Friendly’s restaurant, one he hung out at while growing up in Webster. His parents love the chain, he said, and so do his children. This generational aspect of the Wilbraham-based icon is one of the things that appealed to Condos as he mulled a job opportunity he eventually accepted — president and CEO of the company — as well as a stern challenge: to re-energize a somewhat tired brand. George Condos was asked for a current copy of Friendly’s lunch/dinner menu for a quick read of its contents. “Have you got half an hour?” he joked, implying that he wouldn’t put ‘quick’ and this menu together in the same sentence. “This is not what we’re really about — it takes the focus away from what makes Friendly’s great,” he said of those last few items, adding that they are far removed from the company’s core of hand-held food items, the signature Fribble milkshake, and ice cream. They serve largely as a distraction to the customers, but also to managers and kitchen staff who must order and prepare foods that are ordered infrequently at best. “And this is just one of our menus,” said Condos, fanning out different models for breakfast, desserts, and children. Simplifying and shortening them are just a few facets of a very broad plan that Condos, who took the role of president and CEO at Friendly’s in mid-January, has for re-energizing and contemporizing the 72-year-old chain that has been in the news lately — but for mostly the wrong reasons. There have been many stories in publications ranging from the Wall Street Journal to the Boston Globe that have chronicled an ongoing proxy fight involving the company’s largest shareholder, lawsuits filed by 93-year-old co-founder S. Prestley Blake against its current chairman alleging self-dealing, and, most recently, the commissioning of Goldman Sachs to explore options for the company moving forward, including a possible sale. All of the above has become a “distraction” (that’s a word Condos would use often) for the new CEO, who came to Friendly’s after a lengthy stay at Dunkin’ Donuts, where, among other things, he led a repositioning and brand-development effort that more than tripled the number of stores in the Northeast and took sales from $400 million to more than $2 billion. Just five months into his assignment at Friendly’s, Condos sees several signs of progress. Sales are improving, franchisees are, by his account, expressing more confidence in the chain, and steps are being taken to simplify the menu while adding new products. These include an Angus beef burger now being tested; iced lattes, with flavors ranging from French vanilla to caramel, which will be private-labeled in most markets, but sold in the Albany area under the name Seattle’s Best Coffee, the company owned by Starbucks; some new cold beverages called tropical chillers to be ready for summer; and a planned new chocolate/chocolate chip ice cream featuring Ghirardelli chocolate. Co-branding with companies like Ghirardelli and Seattle’s Best is one of the many strategies moving forward, said Condos, adding that marketing efforts will be retooled to reflect the many changes within the chain. They will still emphasize the family aspect of the business, but also focus on the younger audience that is driving many trends in the hospitality sector and society in general. In this issue, BusinessWest looks at the many things Condos has on his plate as he tries to provide a needed spark for a chain with a glorious past but an uncertain future. 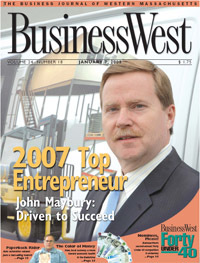 Condos told BusinessWest that he’s probably eating at Friendly’s three or four times a week these days. He’s now well-known at the restaurant next door to the company’s headquarters on Boston Road in Wilbraham, but, outwardly, just another customer at the many other locations he’s visited. However, he’s not interested in undercover work. He makes a point of introducing himself and seeking out the manager of every Friendly’s he visits, and comes ready with a long list of questions. These are information-gathering sessions, and to date they’ve been quite eye-opening, with informal reviews running the gamut when it comes to overall grades. “We have some excellent restaurants, but there is some inconsistency,” he said, adding that bringing all of the chain’s 500 or so restaurants up to the same high level of quality, in terms of food, service, and appearance, would be his broad job description. And this was an assignment that appealed to him when he was approached by a recruiter last fall and asked to consider taking the helm of a chain to which he had both a personal attachment and some professional curiosity. After all, Condos met his wife, Laurie, at a Friendly’s in the Worcester suburb of Webster. The two were among the many neighborhood teenagers who liked hanging out at the eatery — a tableau repeated in countless communities across the Northeast over the past seven decades. Indeed, there are now at least four generations that have grown up with Friendly’s. Some of these constituencies have specific needs and tastes, said Condos, adding that the chain’s mission moving forward is to properly address these preferences (lattes, for example) — but without trying to be all things to all people. This may sound confusing, but for Condos, it’s rather simple. The plan is to focus on core products — ones that appeal to all generations, from those that blog to the one that fought World War II. Meanwhile, he wants to add some new products to the menu that appeal to what he called “young people” without elaborating. Condos will bring to this assignment some extensive experience with both restaurants and brands. He started acquiring it at Dairy Queen soon after graduating from the University of Vermont with a degree in Business Administration and Management. “That’s where I learned how to run a restaurant,” he said of his stint with the company, where he eventually assumed the role of regional manager of Operations and Development. At Dunkin’ Donuts, which he joined in 1986, Condos held a number of positions, including area vice president for the Northeast, U.S., Canada, Europe, and the Middle East, as well as vice president of Marketing, Development, and Operations, and, most recently, brand officer for the chain. In that capacity, he was lead executive for Dunkin’ Donuts in the U.S., and responsible for developing brand strategy and execution for the nearly 5,000 franchised stores, which generated more than $4.3 billion in sales when he left, voluntarily, last year following the second of two ownership changes. Condos said he wasn’t looking for work — his intention was to begin a career serving on corporate boards — when he was called by the recruiter last fall. He met several times with the Friendly’s board, and became intrigued with the opportunity to breathe some life into the chain that he knew so well as a customer. “I believed that Friendly’s had some great opportunity that was not being leveraged,” he said. “I saw a brand that has a unique emotional attachment with its customers that was similar to the two brands I had worked with previously; there are certain brands in the world where the consumer loves the brand, and Friendly’s is one of them. When asked about the board controversy and other matters he lumped in a category of “things beyond my control,” Condos feigned turning off the tape recorder on the table in front of him. Condos said he spoke at length with Prestley Blake — still one of the largest shareholders and one who many say simply can’t let go of the venture he started — soon after he arrived at the company, and talked with him again recently, when the discussion included Blake’s positive review of a visit to a Friendly’s in Florida. As for the proxy fight, Condos said he can really only watch as matters play themselves out. Texas businessman Sardar Biglari, the largest shareholder with 15% of the stock, asked for a seat on the board of directors last fall, and Friendly’s gave a conditional ‘yes’; it stipulated that he not seek any additional seats. But Biglari refused, and in a letter sent to the board in early March said he and a business partner are running against two incumbents who are seeking re-election at the annual shareholder’s meeting. Billboards calling for the election of Buglari and his partner have gone up in a few locations locally. And regarding Goldman Sachs’ work, Condos said there are many options that the company will be considering, none of which he cared to discuss in any detail. “We’re not saying that there will be a sale, or that a sale is the only option,” he explained, adding that the review work is expected to be wrapped up by year’s end. By then, he said, moving on to the many things that are within his control, he expects to be able to qualify and quantify significant progress in his mission to bring more consistency and overall quality to his product — which he described as both the food in the restaurants and the manner in which it is delivered. This will be a three-pronged approach, focusing on menu choices, service, and the appearance of the restaurants, he said, adding that steps are being taken with regard to each. On the menu side of the equation, simplification is the order of the day, he said, emphasizing greater focus on handheld items (burgers, melts, wraps, and chicken-strip baskets, for example), cold beverages, including the new iced lattes and tropical chillers, and ice cream. The chain will still offer appetizers, entrée salads, kids meals, and breakfast items, but it will focus its marketing, menu, and operations on the core items. This approach can be seen with that lengthy lunch/dinner menu, which was actually made one page bigger, with a large insert touting five new burgers, including the tomato pesto provolone and ‘Chicago firehouse’ models. Subsequent inserts will feature other menu staples, said Condos, adding that the new approach is already registering results, with a noticeable increase in sales. Meatloaf and grilled flounder are still on the menu, but perhaps not for much longer. 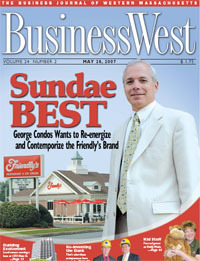 “Those are not core to what Friendly’s is, and continuing to expand in that direction is a distraction from the main part of the menu; it makes it more complex and harder to execute,” said Condos, adding that it took years for the Friendly’s menu to get large and complex, and the process of reversing that trend won’t happen overnight. As for service, the company is introducing something called the ‘Friendly Service Way,’ a model designed to vastly improve the company’s recent poor grades in customer service, at least as measured by Consumer Reports. “When your brand name is Friendly’s, you absolutely have to be the leader in the industry around what great, friendly service looks like, ands that’s what we intend to do,” he said. “I’ve recognized a big opportunity for us to improve our operating standards within the restaurants. Meanwhile, many of the restaurants will be getting a new, more contemporary look, said Condos, adding that the same can be said of the company’s marketing images. In the past, the company has focused on families, generations of same, and the great Friendly’s tradition, he explained, adding that while this has been somewhat effective in generating sales, a stronger emphasis on food, including tight, close-up images of specific menu items, will be much more so. While addressing the menu, service, and the look and feel of the restaurants, Condos is also focusing on the broad and important matter of franchisee-relations, a task that took on even more significance after it was announced that the strategic initiatives to be explored would include a sale. Condos said he has met with franchisees individually and at district meetings, and believes he’s generating some enthusiasm and support for his plans moving forward. “They’re supportive of the brand, they love the brand, and they’re looking forward to sales-building initiatives that my team and I are working on, including a stronger focus on the core part of the menu,” he said. “They’re also excited about improvements in our marketing creatives. As he talked with BusinessWest about his plans moving forward, Condos displayed the new rounded tubs, called “squrounds,” that started serving as containers for half gallons of ice cream earlier this spring. They replace the rectangular cardboard boxes, or bricks, that have been used almost since the company’s beginning. The change wasn’t a slap at tradition, but rather an acknowledgement that the boxes simply weren’t customer-friendly, or at least as much as the new model. Neither, apparently, does grilled flounder. At least not at this chain, which is trying to shake things up and simplify them at the same time.